Here are some statistical milestones that may or may not be reached during the 2013 NLL season. Of course, all of these numbers are completely arbitrary – does anyone discount Tom Marechek’s achievements because he “only” scored 399 goals in his career and didn’t get the elusive 400th? Of course not, but people seem to like nice round numbers, so here are a few that we may see this coming season. A few players are close to some significant targets this season. Nobody will hit 1000 points unless a new single-season points record is set – Gavin Prout needs 119 points to reach 1000, and Dan Dawson needs 129. The closest points milestone would be 800, which only ten NLL players have ever reached, and which Mike Accursi will reach with only 15 more points. John Tavares has reached more than his share of milestones over the years, and 2013 may feature yet another height to which nobody else has climbed. 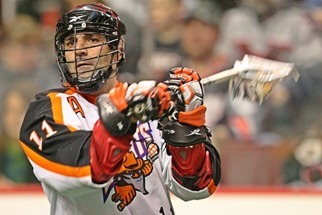 JT is already the only player in NLL history with 700 goals, and with 35 this season, he would reach 800. Tavares had 41 in 2012 so this is not out of the realm of possibility. To put this milestone in perspective, John Grant is the only other active player with over 500 goals, and Junior would need six more 50-goal seasons to reach 800. Colin Doyle could join Tavares and Grant in the 500-goal club by scoring 42. Doyle has only reached 42 goals in one season three times and not since 2006 so this is a bit of a long shot. Potential candidates for the 400-goal club include Lewis Ratcliff (needs 20), and Josh Sanderson and Mike Accursi, each of whom needs 32. Tracey Kelusky needs 43, but seeing as he’s only scored 32 in the past two seasons combined, this is even more of a long shot than Doyle. A few almost-sure things are the three likely new members of the 300-goal club: Aaron Wilson needs 3, Blaine Manning needs 4, and Gavin Prout needs 7. Just as John Tavares is the only player to reach 700 goals, he is also the only player to have reached 800 assists, and Tavares needs just 38 more to reach 900. Colin Doyle would need an 80-assist season (which has only been done once, right Mr. Billings?) just to reach 800. But only four players have ever reached 600 assists, and both Gavin Prout and John Grant are likely to join that club this season. Prout only needs 12 to get there, while Grant needs 26. In terms of loose balls, no previously unobtained milestones will be reached this season. Or the next. Or even the one after that. Jim Veltman’s record of 2417 is safe for quite some time – John Tavares is the only player within eight hundred of Veltman, and Tavares would have to play for 3 1/2 more seasons (at his career average of 97 LB) to get there. But if anyone can reach Veltman’s astronomical total, Brodie Merrill and Geoff Snider are the most likely candidates, and each of them could reach the 1500 loose ball total this season. Merrill only needs 129 (he’s never had fewer than 157), and Snider needs 208, a figure he’s only failed to reach twice in six seasons. But assuming Merrill and Snider keep up their current paces (12.4 per game for Merrill, 14.5 for Snider) and play 16 games a year, Geoff Snider will become the new all-time leader 13 games into the 2017 season. I wrote about this once before and stated it wouldn’t be until 2018, but Snider’s 232 LB in only 14 games last year increased his average. The 1000 loose ball mark is reachable by a few players: Gavin Prout only needs 27, Josh Sanderson 57, and Bill Greer 76. The Colorado Mammoth have three upcoming team milestones, two of which are very obtainable while the third will be close. The easy ones first: the Mammoth are 43 goals away from 2000 regular season goals, and they are 80111 people away from a total of 1.5 million in attendance, including both regular season and playoff games. An average of just 10013 per game in their 8 home games will attain that mark – and the Mammoth’s smallest crowd ever was 12537. The slightly more difficult milestone: 10 regular season wins will give them 100. The Philadelphia Wings’ first loss of the 2013 season will be their 150th regular season loss in their history. This is far and away the most losses for any NLL team, and nobody else is even close. Of course, they’ve played at least five more seasons than anyone else. But consider this: in the last ten seasons, the Wings have only reached .500 three times (and only exceeded it once). The fact that they are still above .500 all-time is a testament to how good they were in the 1990’s. There were only 8-12 games per season, but the Wings had seven straight seasons over .700. In fact, regardless of how they finish this season, they will still end up above .500. Even going 0-16 this season will put them at 169-165. The Calgary Roughnecks’ first home game will be their 100th, and the Riggers could reach one million in regular season attendance this season as well. They are 66896 away from that mark, an average of 8362 per game. The ‘Necks averaged 8313 per game in 2012, so just an extra 50 people per game will do it. The Edmonton Rush should have a much easier time reaching their attendance milestone than the Roughnecks. The Rush only need 19201 to reach the half-million mark. Other than a slight bump from their first season (2006) to their second, the Rush’s average attendance has dropped every season. But unless it drops by over 30% from 2012 to 2013, they should hit the half-million target in game 3. This is a fact that I first pointed out on my personal blog back in 2008, and then reposted on The NLL Blog in 2010 (and have since seen mentioned elsewhere as well): The last time the NLL began a season with the same teams in the same cities as the previous season was 1993. Barring last-minute foldings like the Ravens in 2005, 2013 will end the 19-year streak. If you’re looking for stability in a league that’s shown anything but for almost two decades, this might be the biggest milestone of all.